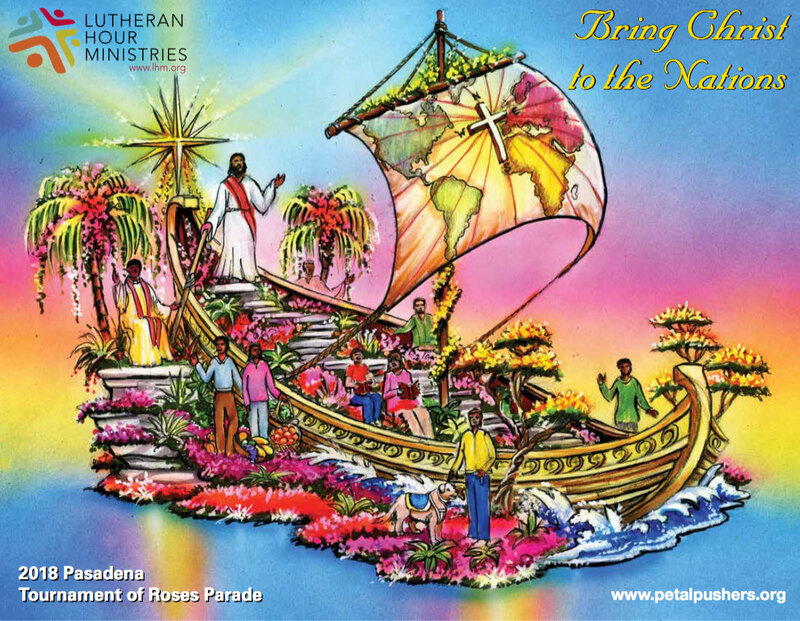 The 2018 Lutheran Hour Ministries Tournament of Roses Parade float is entitled: Bringing Christ to the Nations. The theme of the parade is “Making a Difference.” The float is based on several Bible passages. From John 3:16 we learn that “God so loved the World that He sent His only Son.” This is a huge difference maker in our lives and in the lives of every person in the world. Additionally, in Matthew 28:19 we are told to “Go and make disciples of all nations” and in Matthew 5:16 “Let your light shine before others, that they may see your good deeds and glorify your Father in Heaven.” Jesus also tells us in Matthew 7:12, “To do unto others.” His difference making inspires our ability to make a difference in the lives of others. The float features a boat with Jesus controlling the rudder, steering and directing His followers from many daily walks of life to use their skills and talents, their passions and pleasures to make a difference in the lives of others. Riders will feature a variety of individuals who portray “Making a Difference,” including a comfort dog and handler, a Sunday School teacher and child, a leader of a food bank, a medical professional and a Lutheran Pastor. The boat sail will feature a map of the world with dots representing locations that LHM has International offices along with a Cross. It is our hope and prayer that God would continue to bless His followers and that the Holy Spirit would touch the hearts of all who come in contact with the float. The 2018 Lutheran Hour Ministries Float riders are going to be lead by Dr. Phillip Johnson, Chairman of the Board of Directors for the International Lutheran Laymen’s League. Joining him will be a LHM International Director and LCMS members from Southern CA who represent Difference Making opportunities featured on the float. While the Tournament of Roses Parade is on most network channels, ABC, CBS, NBC, HGTV the Lutheran Hour Ministries Float is not guaranteed coverage due to commercials and/or other TV commitments. For the best viewing of the parade, the Home and Garden channel or RFD TV shows the parade in its entirety on cable TV. Check your local listings for time and channel. Thanks to the volunteer efforts of the Petal Pushers® we are able to reduce the cost of the Lutheran Hour Ministries Float. Last year more than 4,500 people volunteered their decorating talents. These dedicated Christians decorated not only the eight floats we were contracted to decorate, but also helped to complete additional floats. Would you like to work with the Petal Pushers®? Individuals or groups interested in volunteering, please click here, or contact Petal Pushers® Chairman, Lynn Gast, at (949) 458-0606. The 2018 Petal Pushers® sweatshirts and T-shirts are Navy Blue. They feature the traditional Petal Pushers® logo on the front and a representation of the float on the back. Wearing these Petal Pushers® shirts year round serves as a magnificent Christian witness. They also make wonderful souvenirs of the Tournament of Roses Parade and fabulous Christmas gifts. The Lutheran Hour Ministries Float is a project of the Southern California District of the International Lutheran Laymen’s League. In an age that questions Christian values and messages, the Lutheran Hour Ministries Float Committee has remained committed to our mission for more than 67 years. We sincerely invite you to join us in our efforts to bring the hope of Christ to a world in need.